Sat., June 30, 2018, 8:35 p.m.
National medical director Stephen Powis said the health agency could save an estimated $264 million a year by tightening the criteria for treatments where the risks could outweigh the benefits. The list of 17 treatments under consideration to be halted or reduced includes tonsil removals and procedures for carpal tunnel, hemorrhoids and varicose veins. Authorities will discuss the proposals next week. 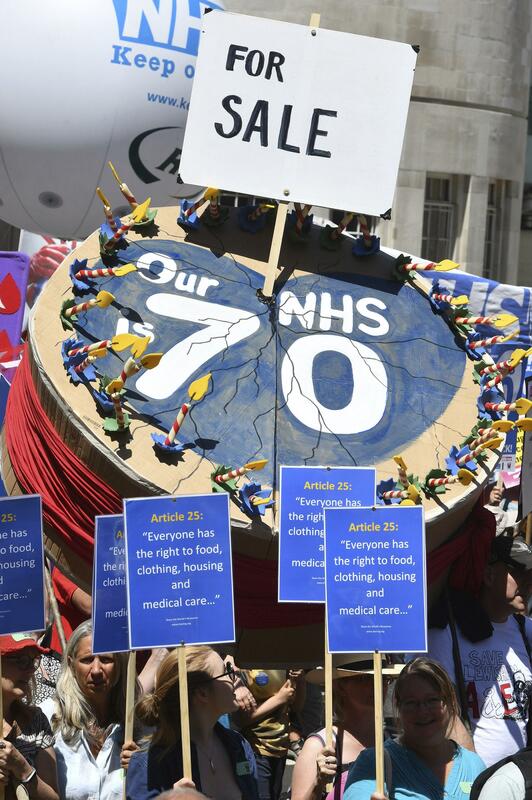 The announcement came as demonstrators marched Saturday in London to mark the 70th anniversary of the NHS and demand an end to funding cuts under the Conservative government. Protesters carried placards and banners reading “Standing together for the NHS” and “NHS SOS” as they streamed toward Parliament. Valerie Bossman-Quarshie said she wanted to give the NHS a “really good cheer” as she held a birthday card aloft to be signed by passing protesters. “They’ve been there for me when I was sick and I just want to be there for them,” she said. Published: June 30, 2018, 8:35 p.m.